After years of speculation, singer Beyoncé Knowles and longtime boyfriend, rapper Jay-Z finally tied the knot on April 4th, 2008. The ceremony was followed by a lavish party at the rapper’s Tribeca apartment that drew Beyoncé’s mother Tina Knowles, her father/manager Mathew, her sister Solange, her Destiny’s Child mates Kelly Rowland and Michelle Williams, and the couple’s friend Gwyneth Paltrow. DJ Cassidy, a favorite of Jay-Z, was hired to spin. 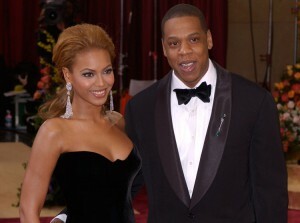 “Cassidy mentioned a week ago that he was really excited for Jay Z and Beyoncé’s wedding party to happen,” says one source. Celebrities Concierge & Staffing Services was honored to provide much of the staff for the event and early Friday morning, workers erected a white tent atop of Jay-Z’s penthouse apartment. Not long after, an SUV carrying what seemed to be AV equipment arrived, followed by deliveries of party rentals and flowers. According to another source, Amy’s Orchids was hired to provide 50,000 to 60,000 white orchid blooms from Thailand for a “big party.” At the apartment, waiters were seen practicing their service. A couple since 2002, Jay-Z, 38, and Knowles, 26, always kept quiet about their relationship, even as they were photographed together on romantic holidays around the world.